Do you need extremely clean and high quality demineralized water with a conductivity of 0,1μS – 0,2μS microSiemens? Do you use, or need, high quality demineralized water (or demi-water) with a conductivity of 0,2μS, or even lower? Then, you can easily and inexpensively produce it yourself, with our demineralized water system. As you might have read already, you can easily and cheaply produce your own demineralized water. The quality of homemade demineralized water is much higher than demi-water that is bought and comes in jerrycans or IBC’s. The conductivity of demineralized water that is stored in jerrycans or IBC’s amounts to roughly 8μS. 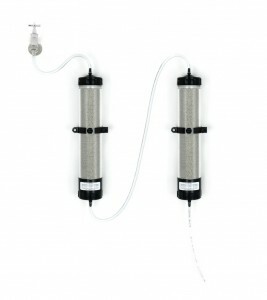 If you use your own tap water to produce demi-water with the demi-water system, it will at least be around 0,2μS – 0,5μS. See our data sheet. Extra high quality demineralized water needed? Do you need demineralized water of a constant low conductivity of 0,2μS (or lower) that is even cleaner? Companies exist that treat demineralized water additionally to achieve extreme low values. This comes with great costs. But did you know that quality deteriorates as soon as the cap is removed? The expensively achieved values disappear into thin air. You might assume that quality stays the same. But every time the cap is removed, it worsens, because of pollutants that enter through oxygen. The values increase rapidly. Produce high quality demineralized water using a double demi-water system. To achieve and preserve (the right) high quality of demineralized water, we have thought of the following: two saleskits next to one another. See image! The first saleskit will be connected to your water supply. The second saleskit is placed next to it and is connected to the (supplied) hose that is attached to the bottom of the first saleskit. The first saleskit figures as a pre-cleanse that produces perfect demi-water. See data sheet for quality details. Because your homemade demi-water flows from the first saleskit into the second and undergoes a second cleansing, the process repeats itself and conductivity values drop even lower, increasing quality even further. Constant conductivity values of 0,2μS microSiemens or lower, are no exception. You can tap your freshly produced demi-water from the bottom side of the second saleskit. Maintaining demineralized water of constant high quality. Using the second saleskit with tube, you can produce large amounts of demi-water, because the first saleskit figures as a pre-cleanse. Saleskit 1 featuring the tube, will start to change color after a while and needs to be replaced at the end of its life span. You can tell by the change of color of the resins, that turn from green to blue. The second saleskit featuring a tube will start changing color after tube 1 is spent, and will have to be replaced as well. Because the second tube is not yet at the end of its life span, you can continue to use it, but it will be moved to saleskit 1 and function as a pre-cleanse. A new tube is placed in saleskit 2. To start producing demineralized water again, you have to drain away the first 1.5 litres of demi-water. After this, you can continue the process. Ensure an open outflow to prevent overpressure! If you follow this procedure, you will maintain to achieve the required quality of demineralized water, that lives up to your standards. The water will be very pure. Pollutants will drop to extremely low values. From now on, you do not have to buy demineralized water anymore. You can easily and inexpensively produce your own. We would like to recommend testing out demineralized water before using it. This will cause you to always be aware of the quality and you will never have to wonder if it is what it should be. Demi-water quality depends on the quality of your tap water.